Bimal Golchha, who merged his eye for detail and the power of imagination to launch Panchwati Silks, a menswear store from the late 80s, has recently launched a second store in Banjara Hills amidst the city’s most elite and fashionable jet-setters. A one-stop shop for all clothing needs, Panchwati Silks’ designs are well-fitted and accommodates all budgets, whether big or small. Spread over 1600 square feet, the interior of this spacious store is a true representation of their designs. With their new line of jewellery for men just around the corner, we caught up with Shivani Gochha, the second generation owner, to discuss the key ideas behind their latest venture. Read on for the full scoop. What inspired you to start Panchwati Silks and what are the key ideas behind it? The second store for Panchwati Silks was an idea that was running in our heads from the past 30 years. Fashion has been progressing every day, and over the recent years, it has picked up a quicker pace. For us, the zeal of giving men’s trend a major boost and personal touch is what inspired us to start Panchwati Silks. Our basic ideology is to give the men the look they desire and deserve, irrespective of any occasion. What is your design philosophy? Does it change with time or are you consistent in your approach to fashion? My brother Siddhant Golchha looks after the designing aspect of our store, and our philosophy has always been to play with rich fabrics in different colours. Especially because the fashion sense of people is evolving and people are more confident and open about experimenting with different styles. We believe in changing with time and embracing the new upcoming fashion. Who is the Panchwati Silks’ man? 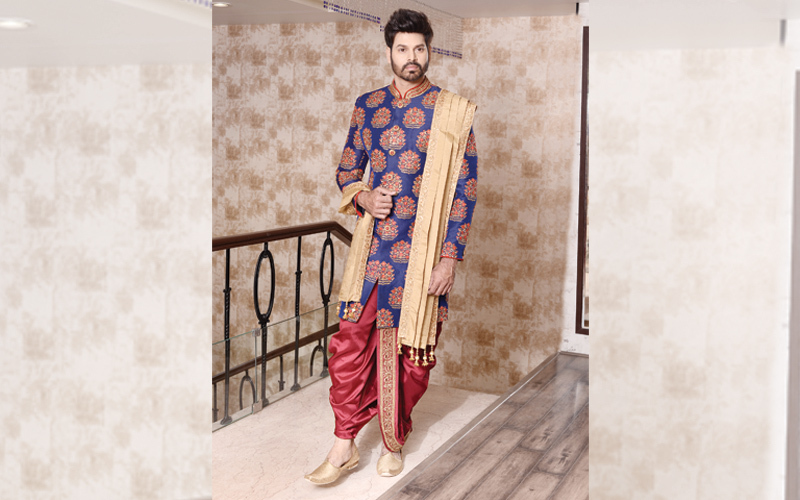 The ideal Panchwati Silks’ man is the one who wants to dress well and look his best in our outfits, which are specially designed and made to perfection, keeping his personality in mind. What items from the store are you coveting most right now? At our store, we cater to all kinds of men’s clothing including sherwanis, Indo-westerns, bandgalas, kurta pyjamas, jackets, and suits. We are also stocking accessories like cufflinks, pocket pins, tie clips, and bracelets. And are there certain pieces that are always in demand? Our Indo-western pieces and asymmetric kurtas are always in high demand all year round. As everybody involved has to work hand in hand and complement each other’s work to create a masterpiece, I guess building a core team is both essential and challenging. Teamwork is always a challenging part of any business, in any field, and that is the backbone of our brand. What edge do you think your brand has over the other brands? Our USP is our designs, ability to deliver services on short notice, our fitting, which is comfortable, and our quality that is unmatched. With the wedding season around the corner, what should a well-dressed groom opt for in terms of silhouettes, colours, prints, and patterns, this season? This wedding season, there are chances of seeing the old bright ethnic colours and traditional fabrics come back to the fore. You will also notice a vast range of prints, like heavy work, self-prints, and asymmetric patterns. However, the essential part is whether the groom feels confident and comfortable in whatever he decides to stitch. What are the closet must-haves for an Indian guy? Kurta pyjamas in silk will make you look classy for any occasion, especially if it is in neutral tones. You can add a custom-fit Modi-jacket and pair it with mojris. For formals, team a custom-fit black suit with a trendy and sleek tie and style the look with classy leather shoes. Who, according to you, are India’s top three well-dressed men? Ranveer Singh, for his loud and bold style. He is one actor who is not afraid to experiment with vivid outfits. Then, I like Karan Johar’s style, as he is always on-point with formal dressing, and then we have Amitabh Bachchan, who tops the list of well-dressed men. Panchwati Silks, in the coming five years, will be renowned for its bespoke tailor fits and its vast variety of designs and fabric purity. We are hoping to expand our fashion brand and services of bespoke tailoring in other cities as well.